The symposium will take place on April 24 & 25, 2019 at The Globe and Mail Centre in Toronto, ON, Canada. 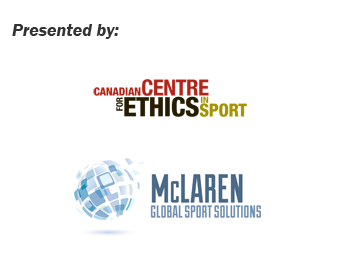 Led by Professor Richard McLaren, O.C., CEO of McLaren Global Sport Solutions Inc. (MGSS), and moderated by Declan Hill, investigative journalist, academic, and international expert on match manipulation in sport, the symposium will be organized by three themes. There will be a keynote speaker for each theme, followed by additional presentations, panel discussions, small group discussions and plenary sessions. Match manipulation and the growing danger to sport’s integrity: An overview of the phenomenon of match manipulation and its connection to globalized sports betting, organized crime and corruption. The current state of gambling in sport: An overview of the prevalence, challenges, risks and opportunities associated with sports betting in Canada and abroad. The Canadian sports betting and integrity landscape: A presentation of Sportradar’s research and analysis on sports betting in Canada, as well as drawing on their global experience detecting and preventing match manipulation and thoughts on what protection measures sports in Canada need to have in place. An international perspective: Exploring the impact of match manipulation on the integrity of sport and state-of-the-art approaches to mitigating the issue. The international federations’ response: An example of the way an international federation addresses integrity matters: the International Association of Athletics Federations’ Athletics Integrity Unit. The international federations’ response: A comprehensive approach to dealing with the growing risk of match manipulation by the International Ice Hockey Federation. The professional sport perspective: An overview of the strategies and best practices from North American professional sports leagues. The European Convention – a Global Solution: An overview of the development and implementation of the Council of Europe Convention on the Manipulation of Sport Competitions as well as the Network of National Platforms. The legal landscape: Exploring the legality of sports gambling and match manipulation in Canada, including regulation and the consequences associated with engaging in unregulated forms of gambling. AthletesCAN: Sharing the athlete perspective on the growing threat of match manipulation and gambling in amateur sport. Match manipulation in Canadian sport: A national sport organization’s experience, its associated impact, and the organization’s response. An overview of Sport Canada’s perspective on the issue of match manipulation and gambling in sport in Canada. Presentations will be given in English. Symposium materials will be provided in English and French.